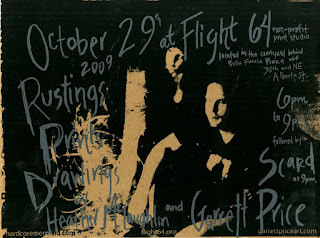 I have a one night show of new rustings and prints on Thursday October 29th, at Flight64 Printmaking Studio. The show is with fellow F64 member and super talented printmaker Heather McLaughlin. The end of the night will feature a live performace by renowned and reviled audial antagonist, SCARD. Click the flier image below for more information.